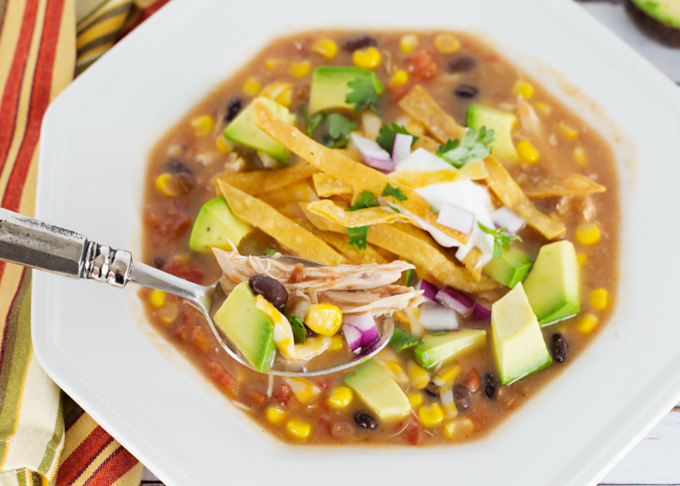 Winter, Spring, Summer, or Fall, I love soup! All kinds! Broth based or chowders, I love them all! In fact, I don’t think I’ve ever met a soup that I didn’t like. Gimme all the soup! 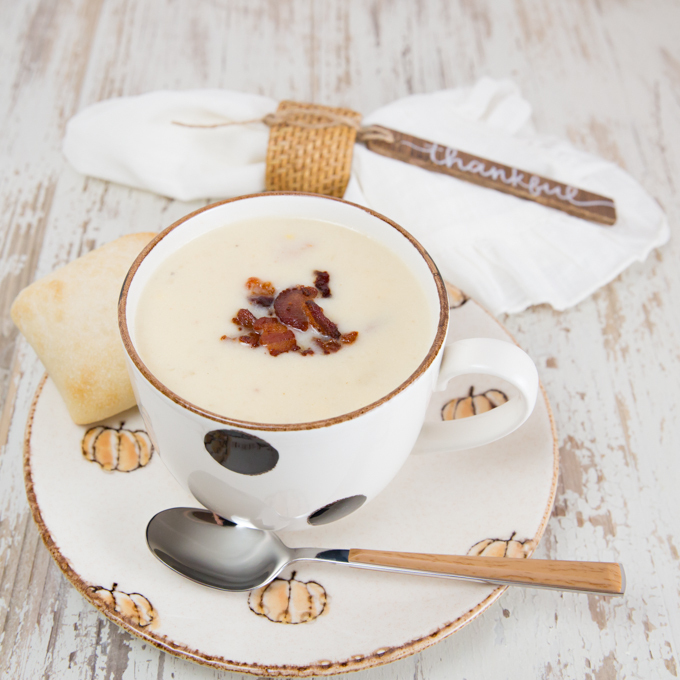 Looking to make one that I’ve had plenty of times, but have never made, I decided on the Potato Corn Chowder. My husband and I both loved it and I know that I’ll be making it again soon! We enjoyed ours one night with a grilled cheese sandwich, another with a side salad, and once with just a warm crusty dinner roll. I’m a dipper when it comes to soup, so I always enjoy bread with mine. “Chowder is a type of soup or stew often prepared with milk or cream and thickened with broken crackers, crushed ship biscuit or a roux. Variations of chowder can be seafood or vegetable. Crackers such as oyster crackers or saltines may accompany chowders as a side item, and cracker pieces may be dropped atop the dish. 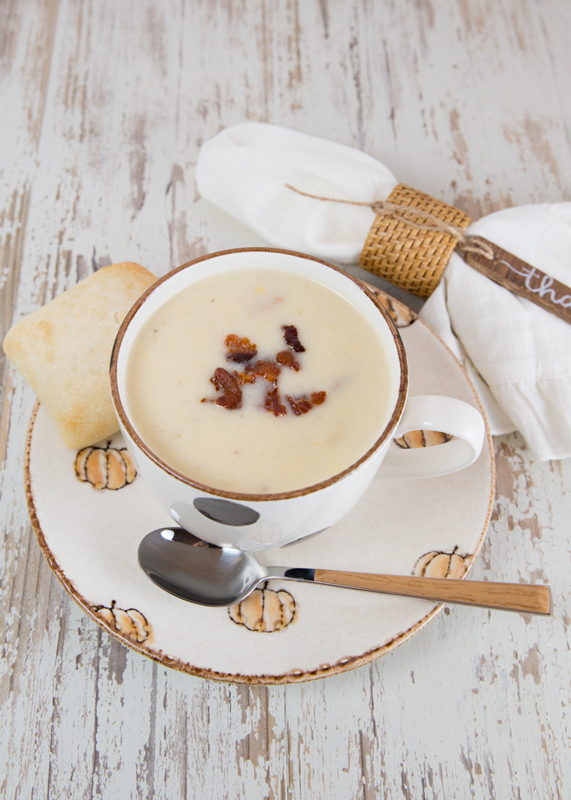 New England Clam Chowder is typically made with chopped clams and diced potatoes, in a mixed cream and milk base, often with a small amount of butter. Other common chowders include seafood chowder, which includes fish, clams, and many other types of shellfish; CORN CHOWDER, which uses corn instead of clams; a wide variety of fish chowders and potato chowder, which is often made with cheese.” Wikipedia. 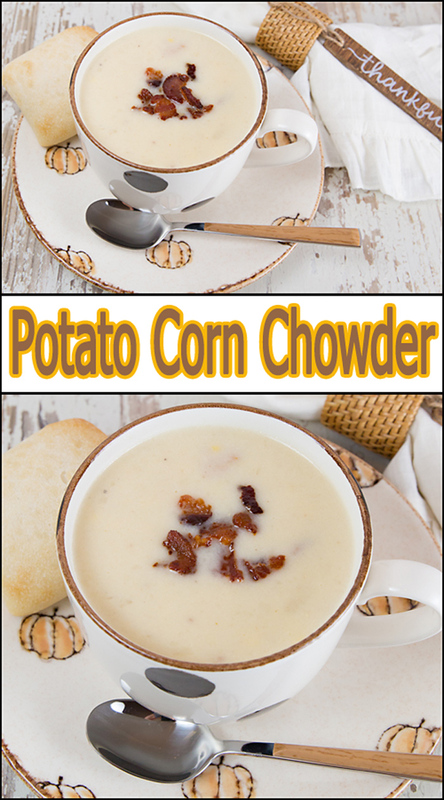 It was easy to find a lot of Potato Corn Chowder recipes by googling and also on Pinterest. When I’m looking for a new recipe to make, I use those sources, plus flip through my dozens of cookbooks. I usually find a couple that I know will be good recipes and adapt it to make it my own. A little more of this, and a little less of that and I’ve created a chowder that we love! 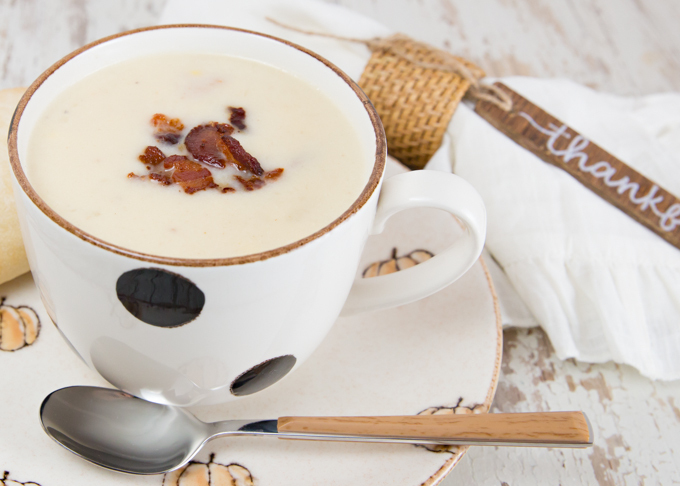 I know you’re probably thinking that chowder is too “full fat.” It might be if you are truly on a dairy restricted diet, but this recipe makes a huge pot of soup, so please, don’t let the two cups of milk and cup of cheese sway you from making this Potato Corn Chowder. Yes, there is plenty of dairy, but the base of the soup is broth, so per serving it’s not much (remember it makes a big pot of soup). 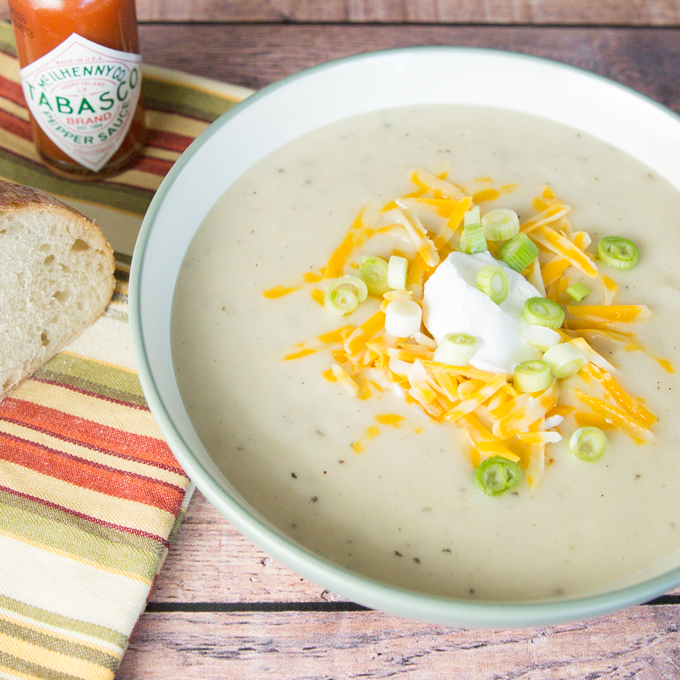 If you love soup as much as I do, make sure and PIN to your favorite Pinterest Board! Now take my recipe and make it as is (it’s really good) or adapt it to make it your own. Either way, make a big pot of Potato Corn Chowder soon! In large soup pot, heat olive oil over medium heat. Cut bacon into small pieces and add to soup pot. Cook until crisp. Remove bacon and drain on paper towel. Drain all but 2-3 TBSP fat from pot. Add onions to soup pot and cook for 5-10 minutes or until translucent. Peal and small cube potatoes. Add potatoes and chicken broth to soup pot, bring to a boil stirring often. Reduce heat, cover, and simmer until potatoes are tender (20-30 minutes). Once potatoes are tender, you may continue on to following steps, or, if desired, use a potato masher or emulsion blender to mash apart some of the potato cubes. In small bowl, add flour to soft butter and stir together until well combined. Once potatoes are tender (and mashed or not, your choice), increase heat, add milk, and stir in butter/flour mixture, stirring constantly as soup thickens. Reduce heat back to a simmer and add corn, bacon, and grated cheddar cheese. Continue to simmer until corn is tender. Season to taste with additional salt and pepper if desired. 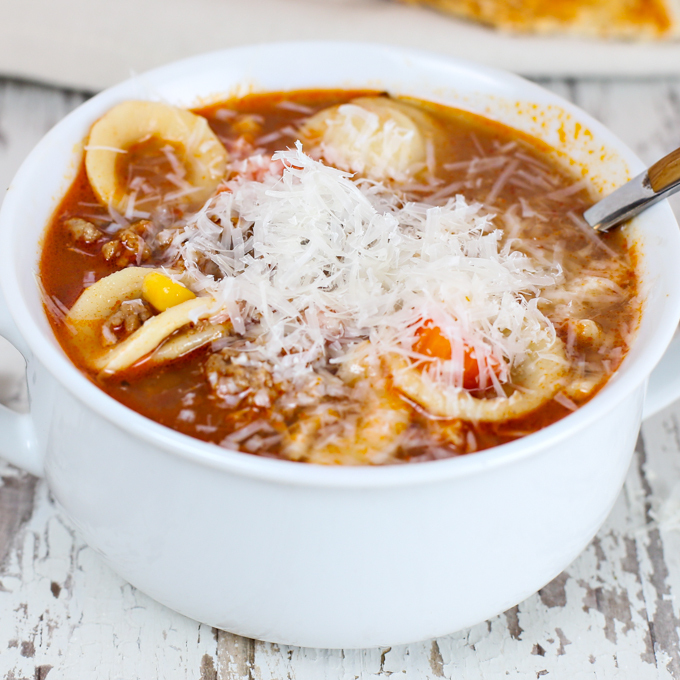 Here’s a few more of my favorite soups!